My cat and dog, so cute! I'm Sarah, age twelve and I recently got a dog, and she likes to "play" with my cat. 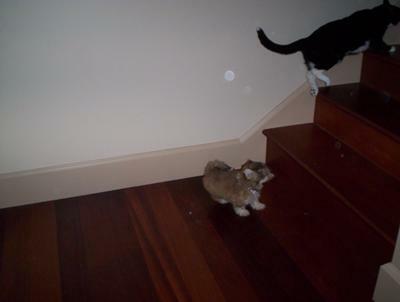 She is small, a havanese (also small for her breed), and she'll come and jump on my cat. My cat will plop over on her side and paw at Tessa (my dog's name). Angel (my cat) some times walks close to Tessa then plops, like she is asking Tessa, "Come play with me". They are so cute!